How Eleanor came to visit me one stormy night is a story that succeeded another story of mystery and intrigue. 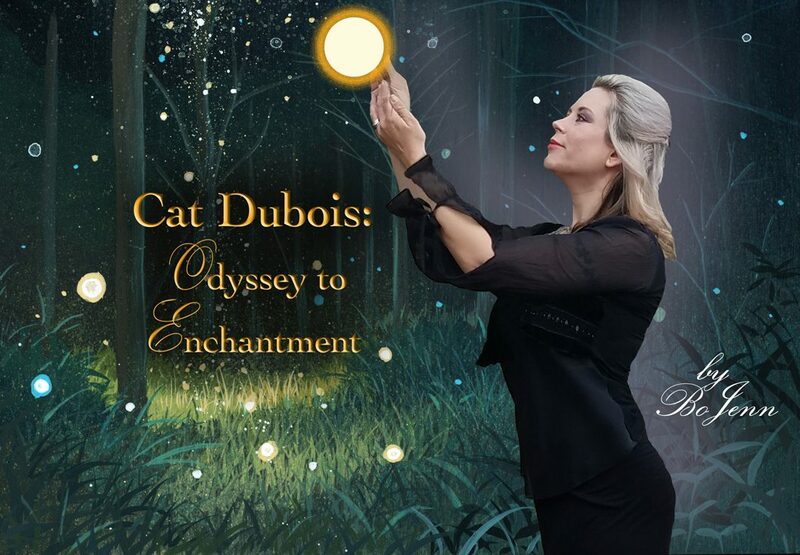 The story thus became Cat Dubois’ Odyssey to Enchantment. It was early fall and the first chill came that evening as the sheets of rain fell. Cat starred out the back windows simply mesmerized by the shears of wind and rain. She was cold, lonely and worried. The dreaded fears of the future somehow aligned itself with the deluge of water and her life appeared like the rain that ran off into the creek. Her tears could fill that stream that sat next to the eery woods behind her home. She prayed all the prayers that anyone could. Her Hope dimmed like the candles that burned next to her. And then, the electricity turned off. A transformer must have been hit. She threw a log into the fireplace and poured another glass of Cabernet. Ka-Boom! The bolts were over her home. Flashes of lights were all around. The electric sky put on a show. A limb snapped in the woods. Wrapping a blanket around herself, she watched outside. She took another sip of the red warming wine. As she started to turn away, something caught her attention. Something unusual was going on back there. “What’s that?” Cat whispered. There were swirling leaves and lights in the middle of her focus. “What the hell?” She intently stared now. The stirring of wind, leaves and sparks twenty feet from where she stood, caused her to stand back. She came forward and looked again. “There is a woman,” Cat gasped. Eleanor’s feet touched the ground in the middle of the puddles. Kaboom’s popped. Her hand grasped an umbrella. The woman didn’t seem a bit concerned about the conditions. She simply walked above the water towards the back porch. Cat’s mouth dropped open, she said, Okay. She couldn’t decide if this event was good or evil; although, the woman was eccentric and that character trait, Cat felt compelled to entertain. She was a bit wary of an English woman. Strangely, She didn’t ring the front doorbell, nor knock like regular people do. She just appeared. Oh Lord, I’ve lost my mind. I’ll be here on the first next year! And saying goodbyes ~ He departed. I want to thank the wonderful artist who donate their work so that poets may write to their images. Thank you PIXABAY artists.